But that’s not all. 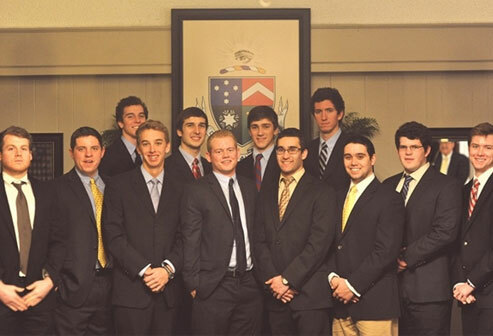 It also led to the creation of a new service-based organization pioneered by Adam and some other Delts. Through Club Sandwich, students fulfill their service hours by preparing and delivering sandwiches to food banks, soup kitchens, and homeless shelters throughout the Southwest Ohio region. The club is partially funded by the school, but also welcomes donations to help purchase ingredients. If you’d like to support the club’s work, contact Adam at roecklac @ miamioh.edu. The group quickly decided the most meaningful way to achieve their goal was to start their own organization. Since its inception early this spring semester, the organization has grown to 50+ members, with a very strong presence of Gamma Upsilon brothers. “It feels wonderful knowing that we had such a strong backing from many of the brothers to help get us started,” Adam says. Though it’s early on, he has high hopes for the club. Looking toward his future, Adam plans to pursue a law degree after completing his degree at Miami (Economics with a minor in business legal studies).